What distinctions can be made between aesthetics, a personal reaction to physical or visual stimuli and is subjec­tive. Pleasure is revealed by sensation through the tactile nature of materials, finishes, and comfort as well as the visual nature of color, shape, and form. For centuries, delight has been associated with concepts of pleasure; however, delight elicits a range of emotional reactions (positive and negative) closely linked to the notion of arousal. Arousal theory has been influenced by the work of Daniel Berlyne, Joachim F. Wohlwill, Albert Mehrabian, and James Russell during the 1960s and 1970s. Laboratory work in experimental aesthetics and studies in the physical environment conclude that pleasure is related to the observer’s level of arousal, and arousal is influenced by the uncertainty created by the environmental stimulus.20 The pleasure-arousal hypothesis is based on Berlyne’s finding that pleasure and stimulus uncertainty are related. Berlyne theorized that pleasure resulting from exposure to a visual stimulus increases with stimulus uncer­tainty until the observer’s arousal level becomes uncomfortably high, at which point pleasure decreases. If pleasure results from exposure to a stimulus, then we might consider unpleasant as well as pleasant stimuli as inherent within the nature of beauty. The bombing of a Basque town during the Spanish Civil War inspired Pablo Picasso’s painting Guernica. The painting intends to make the viewer feel the horrors of the war, but the experience results in the sensation of pleasure. Traditional ideas of beauty suggest that geometry, proportion, and form inspire and please both the mind and the soul. In architecture, design, and art, ideas about beauty, geometry, proportion, and form fuel the sensation of delight. 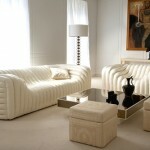 In furniture design, placement and orientation in space along with the visual and tactile experiences generate delight. be added or taken away or altered except for the worse. "22 Alberti’s statement emphasizes wholeness—an important concept to consider in design. Alberti describes the joining of lines and angles as an important and difficult task. Furniture designers must contend with the complete integration of structure, utility, spatial context, material, and aesthetics, in which any one factor can disrupt the harmony of design. Achieving harmony in furniture design is an ever-present challenge. One way to understand the idea of aesthetics in furniture is to consider notions beyond beauty. Furniture design can be about comfort and production techniques, as well as about the organization of parts into a coherent whole. Consider the Eames lounge chair and otto­man designed by Charles Eames for Herman Miller (Figure 5.37). The lounge and ottoman share intertwined relationships of material, form, and use. The totality of the expressed components achieves a sense of a whole out of carefully integrated parts. The chair reveals a disciplined order that demonstrates the capabilities of the designer and offers inspiration for other designers to build upon. phenomenon that is dependent on several tangible and intangible components working together. Aesthetics comes from the Greek word aisthetikos, meaning "perceptive, especially by feeling. "24 Aesthetics is the branch of philosophy dealing with the beautiful. Aesthetic theories intertwine with design principles. They serve as lenses through which judgment is made about formal qualities in furniture design. In the design phase, aesthetics are studied and modified by using drawings and models. These efforts require a thorough understanding of geometry and the communication skills necessary to explore and refine design ideas. Euclid’s Thirteen Books of the Elements was written around 300 BCE and was translated by Sir Thomas L. Heath in the nineteenth century. It presents the rules and principles of geom­etry, with a focus on lines, angles, planes, circles, ratios, proportions, polygons, and cylin­ders. It is an important source that covers the mechanics of geometry. Geometry is the foundation of composition. In order to conceive, design, and draw furniture, one must have a technical or intuitive knowledge of the rules and principles of geometry. palm, cubit [1 cubit equals the length of the forearm when extended], head, arm, propor­tion of elegance) and from relationships between door size, windowsill height, room dimension, and so on. Furniture responds pro­portionally to the human body and to the inte­rior space in which it is placed. Ad Quadratum and Ad Triangulatum Ad quadratum ("by the square") and ad tri­angulatum ("by the triangle") are geometric systems that designers have used to create unity in their work. Ad quadratum is based on the ratio of the side of any square to its diago­nal (1:ff2). Spatial and formal relationships in the chair’s components and inlay shown in Figure 5.38 were derived using ad quadratum geometry. as.6182:1.25 The Golden Section was the principal proportional system used to resolve the plan, elevation, and section of the altar shown in Figures 5.39 and 5.40. Analysis of the geometric basis for many design elements that employ the Golden Section illustrates an almost exact mathematical progression known as the Fibonacci series of numbers 0, 1, 1,2, 3, 5, 8, 13 . . . in which each number is the sum of the two numbers preceding it. The Golden Section and the Fibonacci series are proportional systems that have influ­enced aesthetic theories for centuries. From the Renaissance to modernism, systems of geometry have been inherently, intuitively, and deliberately incorporated in the design of furniture. Beginning with the shift to functionalism, however, the importance of geometric systems began to give way to more humanistic considerations of commodity, social use, and ergonomic theories. In today’s culture of digital design, there has been a reconsidera­tion of Euclidean geometry and the Golden Section for more complex and organic formal possibilities through the use of digital hardware, digital software, and digital production machines.